We’d love your help. Let us know what’s wrong with this preview of A Waste of Shame and Other Sad Tales of the Appalachian Foothills by Geoffrey Smagacz. 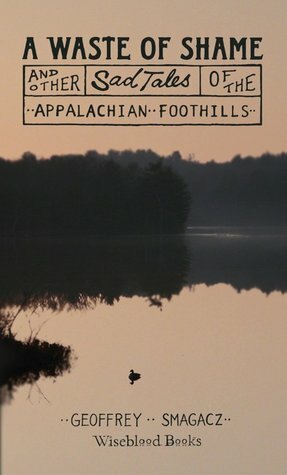 To ask other readers questions about A Waste of Shame and Other Sad Tales of the Appalachian Foothills, please sign up. A Waste of Shame perfectly describes how mind blowingly numbing rural life can be. I know, I've lived there. You could spend your whole life looking for something exciting or even a literate conversation. 3.5 stars really. I enjoyed reading it; felt like I was reading the beginning of a good novelists career. Maybe woulda been 4 stars but it did feel a little too much like short stories strung together, and it had a short story ending. But I'll read whatever he writes next. The story was ok. Interesting to have a novel with short stories included. I won this book through goodreads. Probably one of the worst books I've ever read. In addition, like many B movies, it gives readers a very negative opinion of a particular group of people as a whole. In the interest of full disclosure - I won a free copy of this book through a Goodreads giveaway. The novel/novella after which the book takes its title makes up the bulk of the work. It is a tale of a circle of young people, trapped in a small town, seemingly doomed to live and relive sad episodes that largely focus on who is sleeping with whom and on the threads upon which friends and family relationships are built and broken. I can't say that I found it very appealing. The author is able to c In the interest of full disclosure - I won a free copy of this book through a Goodreads giveaway. The novel/novella after which the book takes its title makes up the bulk of the work. It is a tale of a circle of young people, trapped in a small town, seemingly doomed to live and relive sad episodes that largely focus on who is sleeping with whom and on the threads upon which friends and family relationships are built and broken. I can't say that I found it very appealing. The author is able to capture a high degree of verisimilitude, but I'm guessing this is gained from actual experience. I started out life in such a place and can vouch for the reality of the painful, inane dramas that make up much of this existence. That being said, Smagacz doesn't bring anything new to the table. There is no insight nor observation that invites us into the characters' inner world or finds any particular value or lesson in their suffering. In fact, I found myself wanting to flee from all of them. It was a real task to finish this part of the book. The real entertainment and literary value of this book lies in the vignettes after the novel. It is here where Smagacz finds his real voice. With colorful turns of phrase and a true sense for the ironic and perverse dimensions of life, he offers quickly sketched characters who, all the same, manage to shine in the narrow slices of life in which we see them. His ruminations in the author's voice also offer some succinct and piercing observations worthy of further development. Pages 143-181 almost make up for pages 3-139.